Our receptionists and team will attempt to accommodate all requests to the best of our ability. We have a wide selection of appointment times available during the week for routine check-ups, sick visits, vaccines, nail trims, bloodwork, etc. Surgeries are performed on Friday mornings, and farm calls can be scheduled for times when Dr. McKenna is not seeing patients in the office. Emergencies are accepted for currently established clients. If you feel you have an emergency with your pet, please call us or come to the hospital immediately. We are proud to be the only animal hospital in Orleans County to offer emergency care for established clients after hours on most nights of the week, as well as during regular appointment hours. Emergencies can include, but are not limited to things such as ingestion of toxic materials, eye injuries, urinary or gastrointestinal obstructions, trauma from being hit by a car, not eating or vomiting/diarrhea for more than 24 hours, difficulty breathing, seizures, bleeding from the mouth, nose, eyes, or in stool or urine, and difficulty giving birth. If you ever feel that your pet needs emergency treatment do not hesitate to call or come in immediately. If possible, it is best to call before coming in so that a team member can advise you on your particular emergency. We are also available for urgent care when the condition is not life-threatening. If you feel your pet needs to be seen before you are able to get an appointment, our staff will work to "squeeze" you in between scheduled appointments when possible. 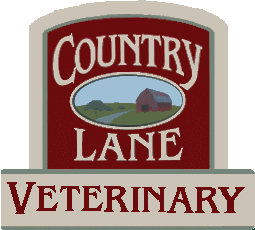 Country Lane Veterinary offers discounted services to senior citizens and local area rescue groups. Pre-approval is required to qualify for the rescue group discounts, please call us for more information.